Will you be celebrating Mardi Gras on March 6th? If you hadn’t planned to, perhaps this fun food dessert project will appeal to you. 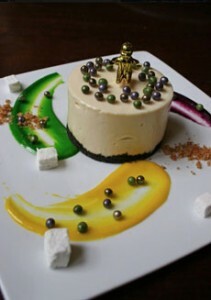 Your challenge: to create your own version of King Cake, the staple Mardi Gras dessert (the history of Mardi Gras). Or bake this recipe from scratch. Or, make your favorite bundt with tri-colored boiled icing. Or cupcakes, with colored batter and/or variously iced in green, gold and purple. It could be any type of cake, cheesecake, a cream pie, cookies, trifle, pastry…. Apply a King Cake theme to one of your favorite desserts. The King Cake (photo #1) is a Mardi Gras tradition in New Orleans, made only during this time of year. Just about every bakery sells the cake. Fans all over the country purchase the cakes by mail order. You can make a classic King Cake with this kit from King Arthur Flour. 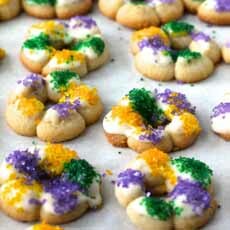 King cake is typically a Danish yeast ring (some are elaborately braided), brioche or cinnamon bread. It is covered by a poured white icing and sprinkled with purple, green and gold colored sugar. What makes a King Cake fun is the hidden charm—originally a baby, representing baby Jesus and now any charm you like. SAFETY NOTE: To avoid broken teeth on a coin, or accidentally swallowing a small charm, choose your charm wisely. The person who gets the slice with the charm gets luck and prosperity for the year. In some traditions is given a gold cardboard crown (the Epiphany Cake tradition) and becomes “king” or “queen” for the day. Most are covered in bright sanding sugars or icings in the Mardi Gras colors: green (faith), gold (power) and purple (justice). Some are filled with candied or glazed fruits. A small toy baby, representing the Infant Jesus, is typically inserted into the cake. The person who gets the slice with the baby wins a gold [cardboard] crown. If you’d like to understand more about it, here’s the history of King Cake. HOW WILL YOUR INTERPRETATION TAKE SHAPE? Colored white chocolate bark, fondue, etc. And, it doesn’t have to be sweet. 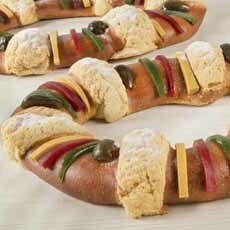 In Spain, Roscón de Reyes (or rosca de reyes—ring of the kings) is traditionally eaten to celebrate Epiphany. You can add the Mardi Gras colors to create King Cake’s brother, King Bread. Consider a savory bread filled or topped with yellow, green and purple bell peppers (photo #6). 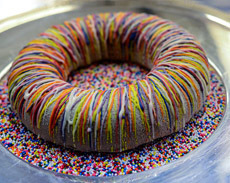 Classic King Cake: a yeast ring with boiled white icing and tri-color sprinkles (photo courtesy Hudson Chocolates). A deconstructed King Cake, a fun variation and a way to show your creativity. Note that the baby is standing on top of the cake (photo courtesy Restaurant Revolution | NOLA). Many cookies are just waiting to be decorated in green, gold and purple. Here’s the recipe for these spritz cookies from Karen’s Kitchen Stories. You don’t have to be an expert baker to create your King Cake interpretation. 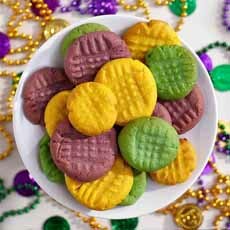 These peanut butter cookies were transformed with food color (photo courtesy Jif). 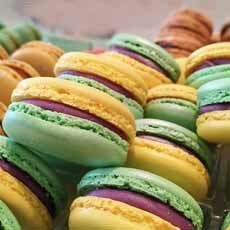 Tri-color macarons (photo courtesy Sucre | NOLA). A savory bread ring with Mardi Gras colors: King Bread (photo courtesy Tres Pupusas).